Some of the most fantastic surround sound rooms are not actually home theater rooms! Media rooms can be family rooms, bedrooms, living rooms, or patios. These are rooms that seamlessly and effectively serve two functions. 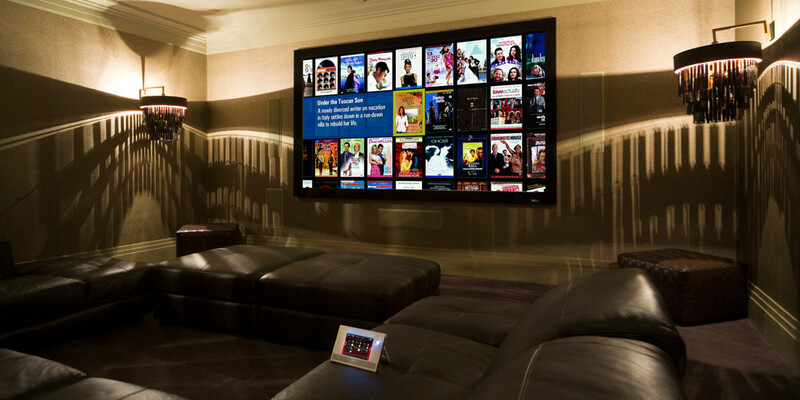 In fact, pretty much any room in your house can be re-purposed into a brilliant Dream Technologies media room that only reveals itself at the touch of a button. Hidden displays such as flip down TVs and retractable projector screens can make it so anyone walking into a room would have no idea that the room also serves as a media room. Due to the high quality speakers working with our calibrated surround sound system, the audio quality in Dream Technology media rooms are almost equivalent to the sound quality in a dedicated home theater. With a video and audio distribution system, you can watch your favorite television program or Blu-ray disc as you move from room to room. With the touch of a button, you can dim the lights, close the shades and get lost in the beautiful surround sound and excellent picture quality of your media room.